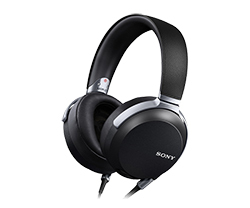 Released in late 2014, these Sony personal audio products are part of an ongoing roll out of numerous products rated for playback of high resolution audio. The products under review here are the Sony MDR-Z7 Headphones, the Sony PHA-3 battery powered DAC/headphone amp and the Kimber Kable MUC-B20BL1 balanced headphone cable. Despite that they were not the most neutral sounding products I’ve heard, I nevertheless fell in love with their open sound and their special qualities in the treble. I also found all three of these products to be very well made and one would expect them to retain their value over many years of normal use. The products under review here were announced via a media event at the 2014 Rocky Mountain Audio Fest. Sony was making a really big deal out of the launch. That alone got my attention so I made a point to attend the release. The short listening session that ensued cemented my impression that there was indeed a fire generating all that smoke. I subsequently requested review units of the Sony MDR-Z7 Headphones, the Sony PHA-3 battery powered DAC/headphone amp and the Kimber Kable MUC-B20BL1 balanced headphone cable. These are the top of the line personal audio products in the current Sony lineup and are therefore pretty pricey. The phones retail for $699.99 and the DAC/amp is listed at $999.99. But they aren’t just snake oil. Sony has some excellent engineering and people with good hearing who help shape the products. Plus the DAC/amp is designed around ESS Technologies’ best Sabre DAC chip. You get a lot of innovation and proven technologies both with these products. 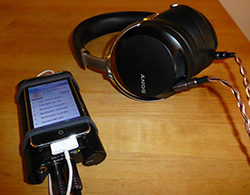 Sony held a major media event at the 2014 Rocky Mountain Audio Fest where they introduced the MDR-Z7’s along with a number of other high quality portable audio solutions including in-ear monitors, portable DAC’s and headphone amp products. These were all being released in anticipation of Sony’s new digital Walkman players as signified by Sony’s “Hi-Res Audio” banner on all the products. The MDR-Z7’s were being billed as Sony’s top of the line headphones. I did have the chance to attend the Sony press event and I also listened to a number of other headphones at RMAF. The MDR-Z7’s stood out in my mind as being among the best I heard that week and so it wasn’t long after the show that I was emailing Sony’s marketing rep about getting a pair in for review. Luckily for me they also sent along a PHA-3 battery-powered DAC/amp and their top of the line upgrade cable from Kimber Kable (MUC-B20BL1). 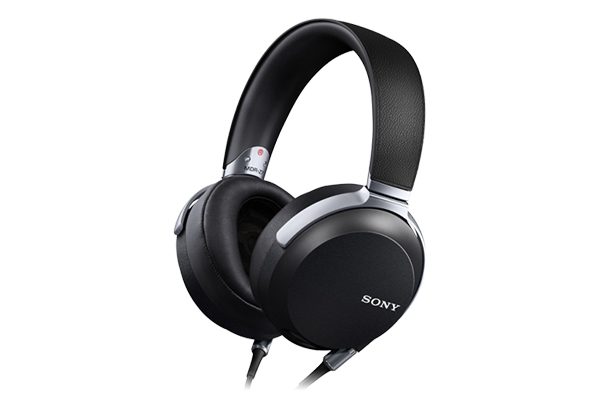 The Sony MDR-Z7’s are over the ear dynamic headphones with extra large 70mm aluminum-coated liquid crystal polymer drivers. Usually one would associate larger drivers with a designer’s desire to increase bass extension and/or output but in this case, Sony has employed a larger driver to propagate sound waves that are planar at the listener’s pinnae, thereby enhancing the soundstage width. The headphones look like they are sealed but they are not. There are small vents at the bottom of each ear cup which Sony claims are there to improve bass response. They do claim response down to 4 Hz with these bad boys. While I can’t hear that low, the increase in extension would theoretically allow the phones to sound more real than many others on the market. Internal wiring is via 4-conductor silver-coated oxygen-free copper. The 4-wire construction means that there are separate signal and ground wires for each driver which is said to enhance separation, expand the sound and offers tighter bass. Sony claims that all these elements combined together lead to a unique headphone listening experience that is akin to listening over a pair of high end speakers. They say listeners can “feel the air” with these phones. The headphones were modestly packaged and come with both balanced and unbalanced stock cables, a 1/8” – 1/4” adapter and a carry bag. The ear cups and head band are aluminum with urethane cushions that are custom shaped for a comfortable fit. All hinges use silicon bushings for a smooth and precise motion. The build quality was beyond reproach as far as I am concerned. 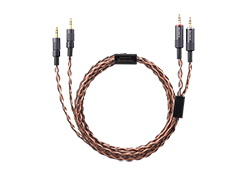 Sony included the Kimber Kable balanced cables with the shipment. These are 2.0 m balanced cables featuring braided cables insulated via a clear insulating medium. They don’t really match the look of the MDR-Z7’s with their purple connectors and copper-colored conductors but I didn’t care. They sounded fantastic and I used them for all my serious listening. I also received the matching DAC/Amp to go with the MDR-Z7’s. This nifty little battery-powered unit is dubbed the PHA-3. It is built around ESS Technology’s top of the line stereo DAC, the ES9018 which is a 32-bit chip rated to have a S/N ratio of 120 dB or better. The PHA-3 DAC/amp is housed in a rugged little aluminum chassis which is pretty large presumably due to the substantial battery pack (5 – 17 hours depending on how it is being used). It can process PCM signals up to 384 kHz/32 bit and DSD up to 5.6 MHz. There are several hook-up options available. You can use the asynchronous USB input for your computer audio, there is a USB input compatible with phones, iPods, etc., there is an optical digital input and, finally, you can use the analog input and treat the unit simply as an amp. There are balanced and unbalanced outs and the unit can also be switched to run line level out the back so it can be used as a stereo DAC/pre. This is a nice configuration because running off the battery means you can get a very clean signal. One glaring omission is that there is no coaxial digital input which limits the unit’s compatibility regarding certain digital players on the market. Like the MDR-Z7’s, the PHA-3 is very solidly constructed and Sony claims it is rated for use in rugged applications. So the power/volume rotary knob and the adjacent output jacks are protected by aluminum flanges that are monolithic with the case. The PHA-3 can drive headphones from 8-600 Ohm. It has a “normal” and “high” gain switch on the side. I used Normal with the MDR-Z7’s and the other phones I tried. There is also a Sony routine/circuit they call DSEE HX which is selectable by a switch next to the gain control. This circuit is said to up-scale low resolution sources to “achieve higher music quality”. All in all, these three products are very solidly constructed and exude a luxurious personality. I was quite impressed with the engineering behind these products as well. I normally don’t like listening to headphones for extended periods. I usually find headphones to be too uncomfortable and confining. They make me feel a little claustrophobic to be honest. So I was most pleased to find the Sony MDR-Z7’s were different than most. They really are defined by an open, airy soundstage. They are also quite comfortable. Sure they are heavier than a lot of other headphones I have tried but they were sufficiently comfortable that I could listen for hours with no complaints. I started my critical listening with “The Cars”, a 24/96 FLAC encode played over JRiver Media Center 20. 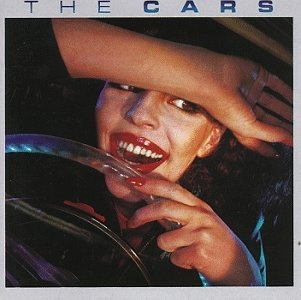 Released in 1978, this was The Cars’ first album. This album was all over the radio when I was in high school. It wound up being 6x Platinum in the US and I must say that most every song on this album was a smash hit. 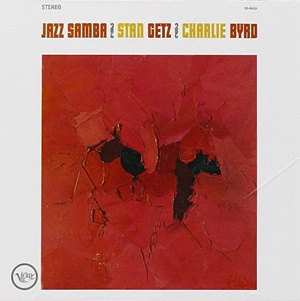 And this is one reissue that sounds like it was taken from a mix consistent with sound the way I remember hearing it. The Sony headphones were warm sounding but with some of the cleanest, most delicate highs I have heard. So the sound never became morose or boring, just warm and inviting. The bass wasn’t super deeply extended; sounding like it rolled off starting around 30 Hz, but it was reasonably tight and tuneful so the satisfaction factor was high. The staging over the MDR-Z7’s was undoubtedly the best I have heard from headphones. It is true that you can really “feel the air” – take the intro to “Moving in Stereo” where Benjamin Orr’s voice swirls around. He seemed to leave the confines of the cans in a very satisfying display of wide staging for a set of headphones. The same held true for the synthesizers and the other pan-potted voices/instruments. this one disappeared one day when I was in college so I was most grateful to grab this high resolution download which I thought would be a good test of the Sony’s frequency balance. The MDR-Z7’s heretofore had displayed a warm frequency balance but with some amazing treble which created an interesting aural dichotomy. 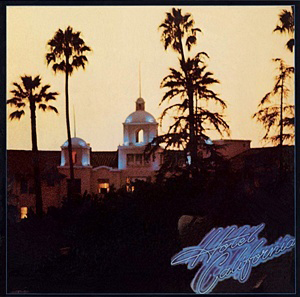 On the title track, Don Henley’s vocals were balanced, clear and highly legible. This was again a good quality transfer that maintained the sound I recall from back in the day but just more extended and without surface noise or obtuse distortion. The closing track is the depressingly prophetic “The Last Resort” and it was definitely warmer sounding than the prior tracks. This was due in part to the instrumentation and in part to the mix so the warmness was certainly appropriate and it didn’t detract from my enjoyment. But again the contrast of a warm overall presentation along with maybe the best sounding treble I’ve heard was remarkable. How about some regular every day Redbook CD music? OK, let’s cue up “Jazz Samba” by Stan Getz & Charlie Byrd. (Ripped from CD to 16/44.1 FLAC and played back also over JRiver MC 20). Acoustic instruments are a much more telling test for a rig like this. Plus I’ve listened to this album literally a million times so I know intimately how it should sound. The staging was once again free of my cranial realm and there were sounds seemingly emanating from well outside the cans. I think this effect is due to numerous factors – the small ports, the size of the drivers, their orientation and the incredible treble. Once again, I couldn’t stress more strongly that this might be the best treble I’ve heard on any system. But the excellence in the sound was not confined there – there were tactile and transparent mids underpinned by clean and musical bass. It was all tied together into a cohesive and coherent blend that was highly addictive. No fatigue just pure goodness. According to Sony, the “advanced Digital Sound Enhancement Engine (DSEE HX™) . . . upscales the existing sound source to near High-Resolution sound quality. 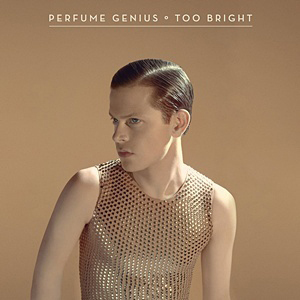 It refines and restores the audio signal to recreate the subtle high-frequency harmonics that are typically lost in heavily compressed MP3 and AAC files.” I tested this while listening to Perfume Genius “Too Bright” which I have as a 320 kbs MP3 download. At first, I thought I preferred DSEE HX off but I changed my mind pretty quickly. With DSEE HX on, there was clearly more inner detail and better treble extension – It was subtle but effective. The sound was more dynamically alive as well. For obvious reasons, Sony is big into the whole DSD thing. I did try this set up with some DSD encodes; the most notable in my mind was a Nat King Cole record. I personally don’t mess around with DSD very often. DSD files are huge storage hogs and playback can lead to high level ultrasonic harmonics that often affect sounds in the audible band. This is because a lot of amps and speakers can’t reproduce the higher harmonics and wind up distorting in their effort to do so. But since the Sony MDR-Z7’s and PHA-3 are rated to 100 kHz, DSD’s sounded much better than usual. So perhaps that is the key to getting the best out of DSD – select wide-range playback equipment. The Sony MDR-Z7’s are not perfect. The midrange was sometimes a bit recessed and the bass was not the tightest or most extended that I have experienced. They were also a bit warm sounding compared to other audiophile headphones I have heard. So sure they aren’t perfect but I personally loved them just the same. I loved the comfortable fit and the extended soundstage. I loved the clean and delicate treble. I loved that they are an easy load and could be driven straight off an iPod if you wanted that. I still remember when I first auditioned the MDR-Z7’s after receiving them in the mail. I knew in the first four seconds that I was listening to something special and then, four hours later, I was sitting there clutching my fifth martini and listening to high-resolution downloads of Norwegian elk calls. Now that is the definition of a great audio product! And in all honesty, I did hear new details in songs that I’ve heard a million times before, even at regular everyday Redbook CD bit rates. The Kimber Kable cables are not an absolutely necessary upgrade but they do make a meaningful improvement over the stock cables and I would certainly advise you to give them a try if you have room in your budget. 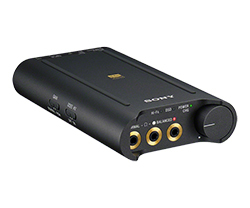 The Sony PHA-3 DAC/amp is equally impressive. I used it for all my critical listening on this review. It can drive any of the headphones I tried with power in reserve. It uses the top of the line ESS DAC’s. It is ruggedly constructed. It is reasonably flexible with several input options and the ability to decode pretty much anything you can throw at it. It sounded no less than amazing over its asynchronous USB input. All three of these products get my highest recommendation.